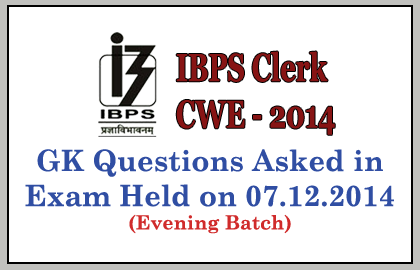 List of General Awareness Questions that asked in IBPS Clerk CWE 2014 held on 7th December 2014 (Evening Batch) were given below. Candidates those who are preparing for the upcoming exams can use it. Who won the Noble Prize in Economics for the year 2014? Where the head quarters of WHO was located? Sardar singh was related to which sport? Where the head quarters of Asian Development Bank was located? What is the name of the Hud Hud Operation? World Standards Day was observed on? Which of the Indian Film has selected for Oscar? Who is the Chairman of Finance Commission? Which Country was affected by Typhoon Vong Fong? Kisan Vikas Patra was related to which scheme? Who is the head of National Disaster Management Authority? Next Asian Games was hosted by?